Electricity and gas meters are fitted to monitor the energy usage at every household and business premises. These meters are a way for suppliers – and you – to measure how much gas or electricity you’ve used during any given period of time. The units are measured in kilowatt hours (kWh). Why is it important to submit a reading? It is important to provide your energy supplier with regular meter readings to ensure you’re only charged for the energy you’ve used – no more, and no less. It is recommended you submit a reading once a month, or at least once every three months. 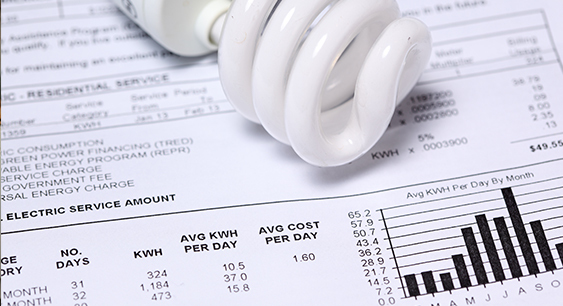 If your supplier does not receive regular readings, they will estimate your usage instead, meaning your bills will be based on this estimated figure. If your supplier’s estimate is too high, you’ll be paying for more energy than you have actually used, and will be due a refund when your supplier eventually reads your meter. However, if your supplier’s estimate is too low, you’ll be paying for less energy than you’ve used, meaning you’ll need to pay the money you owe to your supplier once they’ve read your meter and worked out that you’ve been undercharged. The latter scenario often results in households unexpectedly falling into debt with their supplier, and can leave you facing hefty charges if your supplier has been significantly underestimating your usage. With visits by meter readers becoming less common – it is now prioritised for vulnerable people and those who may have trouble reading their meter – it is up to you to read your meter and submit your meter readings to your supplier. Fortunately, reading your meters is fairly straightforward once you’ve identified the type of meter you have. You’ll either have two meters at your household – one for electricity and one for gas – or just one meter for electricity. Two rate single display meters. Electricity meters measure electricity use in kilowatt hours (kWh). The front panel of each meter contains the information you’ll need to record and submit your meter readings. If your electricity meter is different to the ones below, it might help to contact your supplier for assistance reading your meter. Single rate digital meters: On single rate digital meters, the numbers are shown on an electronic or digital display. There will be five numbers in black or white, followed by one or more numbers in red – or with a red background. Alternatively, there may be seven numbers, with a decimal point separating them. When recording your reading, read from left to right and ignore the red numbers – or the ones after the decimal point. The red numbers will probably be changing all the time – this is simply to show that energy is being consumed. Two rate digital meters: Two rate digital meters may also be called variable digital meters. You’ll have a two rate digital meter if you’re on an Economy 7 tariff where you are charged two different rates – a lower price for electricity consumed during off-peak hours, and a higher price for electricity consumed at other points during the day. Two rate digital meters usually have two rows of numbers. The top row – marked ‘low’ or ‘night’ – indicates the units of off-peak electricity you have used. The bottom row – marked ‘normal’ or ‘day’ – indicates the units of peak electricity you have used. If the rows are not marked, you may need to rely on your previous meter readings to figure out the rates for each row. You’ll need to provide your supplier with readings from both rows. Read from left to right and ignore any numbers shown in red. If you’re on an Economy 10 tariff, there’ll be an additional display to help record the electricity you use across three different time periods. The procedure is the same – read from left to right, ignore any numbers show in red, and provide all three readings to your supplier. Two rate single display meters: Two rate single display meters may also be referred to as variable digital meters. You may have a two rate single display meter if you’re on an Economy 7 tariff. Your meter will either alternate between the two rate readings in a cycle, or have a button that you can press to switch between the two rates. The meter will indicate which rate the numbers refer to by displaying the words ‘Rate 1’ and ‘Rate 2’ or ‘low’ and ‘normal’. For some meters, if the rate indicator is flashing, this means the numbers it corresponds to is the lower rate. If a letter ‘T’ is showing, you can ignore the corresponding numbers when taking your reading. When recording your reading, read from left to right, then press the button and read from left to right again, making a note of which rate the numbers refer to. You’ll need to provide your supplier with both readings. Make sure you take the reading during your specified off-peak hours – typically any seven hour period between 10pm and 8am. Mechanical dial meters: Mechanical dial meters can be more difficult to read than any of the others mentioned so far. You’ll see a series of five or more clock-type dials, each of which has an arrow pointing to a number between zero and nine. You’ll notice that each dial turns in the opposite direction to the dial before and after it. When recording your reading, read the first five dials from left to right and ignore any dial marked ‘1/10’ or in red. Also ignore the very last dial on the right. If the arrow is between numbers, record the lower of the two numbers – this is not necessarily the number closest to the arrow. If the arrow is between nine and zero, record it as nine. If the arrow is exactly over a number, write it down and underline it. If you’ve underlined a number, check the next dial to the right. If the arrow on that dial is at nine – or if you’ve recorded it as nine – you’ll need to reduce the number you underlined by one. So, if you underlined six and it is followed by a nine, you should change the six to a five, and underline the five. Repeat this process until you have a final five-digit number. You may have to go outside your property to find your gas meter. The front panel of each meter contains the information you’ll need to record and submit your meter readings. If your gas meter is different from the ones below, you may need to contact your energy supplier who can help you figure out how to read the meter. Digital metric meters: Digital metric gas meters measure gas usage in cubic meters (m3) and will usually display the symbols ‘M’ or ‘M3’. In digital metric meters, the numbers are shown on an electronic or digital display. When recording your reading, read from left to right, exclude the figures after the decimal but include any zeros at the start. Digital imperial meters: Digital imperial meters are older than metric meters and measure gas in cubic feet (ft3). They will usually display the words ‘cubic feet’ or the letters ‘Ft’. In digital imperial meters, the numbers are shown as a series of analogue numbers, with the digits in red continually changing. When recording your reading, read from left to right, exclude the figures in red – and ignore the dial on the far right – but include any zeros at the start. Mechanical dial meters: Mechanical dial meters are possibly the most difficult type of meter to read – and are being phased out as a result. If you have a mechanical dial meter, you’ll see a series of clock-style dials, each with one arrow pointing to a number between zero and nine. You’ll probably observe that adjacent dials turn in opposite directions. Record the number indicated by the arrow in each dial, going from left to right and ignoring the numbers shown on any red dials. If the arrow is between two numbers, record the lower of the two numbers – this may not necessarily be the number closest to the arrow. If the arrow is between nine and zero, record it as nine. Call your supplier – this is usually an automated meter reading telephone service. You’ll need to have your account number to hand. Text your meter readings to a specified number. Post your meter reading cards to a freepost address. Log into your account on the supplier’s website. Use a special form on the supplier’s website – you’ll need your account number for this. Using a smartphone app – some suppliers now provide free apps you can download to submit your meter readings, manage your account and use other services. Some apps require you to take a photo of your meter and send it to your supplier while others include optical recognition technology which reads your meter via your phone’s camera and transmits this information to your supplier. The alternative to submitting meter readings is installing a smart meter. These meters send usage data automatically to energy suppliers and keep a real-time record of your energy consumption. Your supplier can use these figures to produce accurate bills, and can also use your smart meter to send you updates on your tariff. If you have renewable energy generating technology installed at your home, the smart meter can also measure how much energy you produce – and help you calculate whether you are producing a surplus you can sell back to the National Grid. The government is planning to provide smart meters to all households in the UK by 2020. Under Ofgem regulations, you can control how much smart meter data is accessible to your energy supplier, and whether your supplier can share the information they receive with third parties – or use the information for marketing purposes.